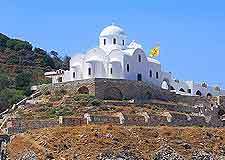 There are some quality attractions which greet tourists as soon as they arrive on the island of Naxos. Apart from the beaches, Naxos is home to some superb opportunities for recreational attractions, such as hiking and trekking, with scenic footpaths leading some very appealing places of interest, including olive groves and vineyards. 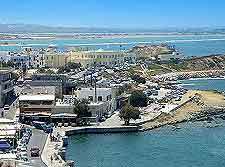 The island's capital and port town, Hora (Naxos Town) lies on the western coast and is split into two main neighborhoods, Bourgos and Kastro, each of which offer more than their fair share of tourist attractions. Many find that their holiday is enhanced by taking a day out to explore the mountain villages within the island's Tragaea region, with both Filoti and Halki being firm favourites. The first neighbourhood that you are likely to encounter in Hora is Bourgos, and this historical district lies within the very heart of the town and was once home to a thriving Greek community. 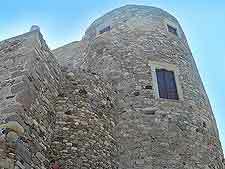 Next door is the medieval, hilltop Venetian Castle, which dates back to the very beginning of the 13th century. The area around the castle is referred to as the Kastro (Castro) district and this walled old town is where, historically, the Venetian Catholics once lived. Sightseeing around the Kastro is an especially pleasant way to spend an afternoon, with many beautiful alleyways just waiting to be explored, and around some corners, some superb harbour views. This island really is one of the most special of all those grouped within the Cyclades, being considerably bigger than Andros, Paros and Tinos. Around the island you will find a host of scenic walking and hiking trails, with footpaths leading to some very interesting sights, such as old churches and woodland areas, and are often highly suitable for mountain bikes. The Tragaea region of the island is overflowing with natural attractions and villages which remain quite untouched and unspoilt by tourism. 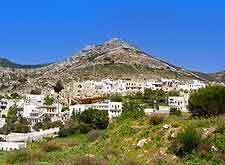 Other attractions around Tragaea include huge expanses of olive groves, which are often found at the based on the various mountains in this part of Naxos. The biggest village within Tragaea is Filoti, which resides on the slopes of Mount Zeus, and is close to the very appealing hamlets of both Damalas and Damarionas. Closest to Filoti is the natural cavern known as the Cave of Zeus (Zas) and also the Aria Spring, which picnicking is almost obligatory. Likely to be a true highlight of any holiday, a visit to the village of Halki is really not to be missed under any circumstances. 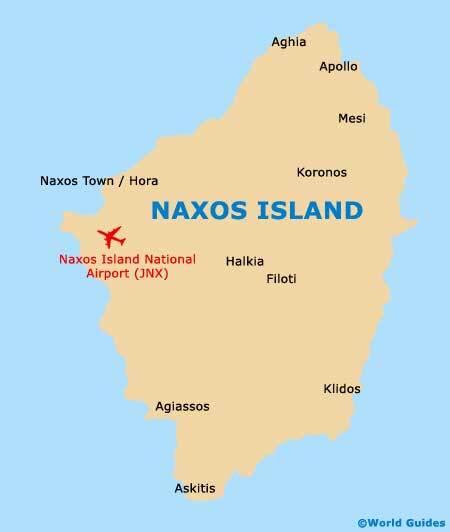 Located in the very heart of the Tragaea region and just a 20-minute drive from Naxos Town, Halki's main attractions relate to its production of the island's very famous 'kitron' liqueur. The Vallindras Distillery stands within the main square of Halki and offers free guided tours to tourists, showing how kitron is flavoured and distilled using rather old-fashioned methods. The mountain village of Apiranthos is particularly atmospheric and enchanting, and is filled with simple stone houses and streets paved with marble. Various alleyways around Apiranthos climb the slopes of the adjacent Mount Fanari, while for most sightseers, it is the village's trio of quality museums that remains the main draw card here. If you have time, do take a drive along the Apiranthos to Moutsouna road, since the views of the mountainous scenery are nothing short of spectacular, although may be a little distracting for the driver. Of interest, the Psili Ammos beach lies directly to the south.